Mrs. Carmel C. Almendrala, Trustee of Autism Society Philippines, was a resource speaker in the July 18, 2014 Quezon City PDAO “Public-Private Consultation Forum on the Employment of Persons with Disabilities.” Mrs. Almendrala spoke on the “Employment Situation for Persons with Autism.” The forum was held at the Bulwagang Amoranto of Quezon City Hall main building. 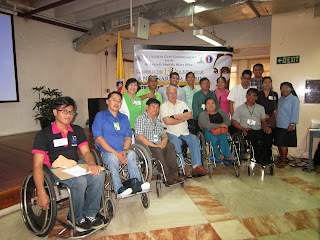 There were various other speakers from DepEd, DSWD, DOLE, Blue Ribbon Committee of the Philippine Senate, JOB START, Manulife and other disability NGO’s who presented their particular work related to PWDs. Mrs. Almendrala discussed individual employment of various persons with autism in competitive setting, as well as group employment in different companies plus future possibilities for employment of PWAs. About the contributor. Carmel C. Almendrala, a former ambassador’s wife and an Ulirang Ina Awardee of 2010, Carmel personifies diplomacy as she faces the world with poise, grace and intelligence. Over the years and in the many countries where their family has had to relocate because of her husband's work, she laboured tirelessly to advocate for her son Michael, now in his 40’s. Serving as Trustee for more than six terms, she reminds young mothers of children with autism: Grab every opportunity and don’t take no for an answer. This is evident in her son Mike, who is a Special Olympian Medalist (who competed in 2005 in powerlifting and in 2013 in bowling), a 2005 Apolinario Mabini Awardee, and an independent member of the community working as an administrative staff of the Philippine Information Agency.